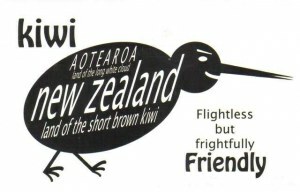 Kiwi are flightless birds endemic to New Zealand, in the genus Apteryx and family Apterygidae. At around the size of a domestic chicken, kiwi are by far the smallest living ratites and lay the largest egg in relation to their body size of any species of bird in the world. There are five recognised species, two of which are currently vulnerable, one of which isendangered, and one of which is critically endangered.